Alhamdolillah, God has enabled Swedish Jama’at to build their second mosque which has been named Mahmood Mosque. Both men and women demonstrated great sincerity in the work of the building of the mosque. Considering the small size of Jama’at in Sweden, this was a huge project. Many in the Jama’at are unemployed, there are also the elderly, children and housewives. While the earning members have made great sacrifices, women and children have not fallen back and have been exemplary in giving precedence to faith over worldly matters in the building of this house of God. Everyone has wishes and desires and indeed needs of their own. Particularly in this age when worldly and material things grab one’s attention, one is astonished to see the spirit of financial sacrifice of Ahmadis. Building as well as acquiring of mosques, mission houses and salat centres goes on around the world, while payment of regular chandas also goes hand in hand. After meeting their own needs well off Ahmadis living in the developed world also help and support Ahmadis who are underprivileged and they are helpful to Jama’ats around the world which are in need of financial support. With the grace of God many in the Jama’at are inclined to eagerly make financial sacrifices. This is the spirit of spending in the way of God and the Jama’at which the true devotee of the Holy Prophet (peace and blessings of Allah be on him) has instilled in us. Just as the Promised Messiah (on whom be peace) used to be amazed at the financial sacrifices of the Jama’at, the sacrifices continue to amaze today and all this is due to the grace of God alone. This is a manifestation of the fulfilment of the Divine promise made to the Promised Messiah (on whom be peace) that God would meet all his needs. The construction of the mosque, plus a two-bedroom accommodation, offices and a library has cost 37.5 million krona, or 3.2 million pound sterling. A murrabi house and kitchen are not quite finished yet and the management thinks it will cost further 8 to 10 million krona. As it is with all Jama’at projects a lot of work was done under Waqar e Aml (a self-help system) which saved a lot expense. Volunteers worked tirelessly only going home for brief periods so that the work could be completely quickly and the inauguration could take place. Yet, some parts are still not completed. Once builders start work they leave/finish when it suits them. Management should have factored this in before inviting Hazrat Khalifatul Masih. May God reward those who have made financial sacrifices or have taken any part in the building of the mosque! It is a beautiful mosque and the locals are also appreciative of its aesthetics. Two days ago newspaper and radio representative visited and commented that it was a beautiful mosque and has enhanced the beauty of the area. Below are some examples of the spirit of sacrifice that adults and children displayed. An eleven year old girl gave a few hundred krona and said she had been saving her pocket money for quite some time. Another ten to twelve year old girl gave 500 krona. She said she had two pet parrots which she sold to obtain the money to give for the mosque. Children are very keen to have pets in these countries but the Ahmadi girl did not give preference to her pets like other children but gave preference to house of God. Indeed, the right zeal and preference is seeking of pleasure of God which Ahmadi children understand. They have an insight from the very start that the Holy Prophet (peace and blessings of Allah be on him) said that a person who takes part in the building of a mosque makes a house for himself in Paradise. The Holy Prophet (peace and blessings of Allah be on him) also said that mosques are the best part of towns and he also said to build mosques among tribes. This is why we try to build mosques everywhere. Journalists often ask about the purpose of building mosques in their area and the answer given to them is that we build mosques for Ahmadis to gather and worship God. A young woman performed I’tikaf and gave her jewellery towards the mosque. The jewellery was not much in quantity but it was all she had and she requested not to let her parents know that she had given it as they had gifted it to her. Another Waqfe Nau young woman wrote a letter to her father and placed it under his pillow along with some jewellery and her saved pocket money. She wrote in the letter I only have this and nothing else that I could give in the cause of God. Newly married young women who were still in the phase of enjoying wearing their jewellery, gave all their jewellery for the building of the mosque. Ladies whose husbands had pledged and paid off their good contributions also gave their jewellery and savings. Two ladies had nothing to give but they had a property in Pakistan which they had received from their father. They sold it and gave the proceeds for the construction of the mosque. A Khadim pledged a large amount, some of it on behalf of his wife. Unfortunately the husband and wife separated. Yet when contact was made for payment the khadim’s father said as they had separated the wife would pay her own share. However, the khadim said since he had made the pledge he would fulfil it. There are people who do not even give rightful dues of women and then there are those, as just mentioned, who in spite of separation fulfil their pledge. In truth it is these people who are worthy of being called true believers. A khadim only had part-time employment yet increased his pledge from 100,000 to 1 million when a plea was made to increase pledges. He made payment of 50,000 krona the following week. When asked how did he manage he explained that he had sold his car and had given the proceeds of the sale plus some saving. Not only was he blessed with a permanent job but was also enabled to purchase a better car. This spirit of sacrifice can be seen among Ahmadis in different parts of the world! The mosque building project was first started in 1999 when Ahsan Ullah Sahib purchased some land and presented it to the Jama’at. The site is near a busy highway and the beautiful mosque can be seen from afar. May God enable every Ahmadi to fulfil their duties after the construction of the mosque and may the mosque, through tabligh efforts, ever be a source of spreading Unity of God and its real beauty, which is the beauty of the teachings of Islam, shine brightly. The mosque complex is 2,000 square metre and has five large buildings. There is the mosque and a sports hall. The mosque has two Prayer halls, one for men and the other for ladies. Some raise objection that [in Islam] women are not accommodated in the same building, so here is an answer for them. Ladies hall and men’s hall are both in the same building and exactly the same size. They both accommodate 500 worshippers whereas the sports hall can accommodate 700 worshipers. Thus at a time 1700 worshipers can offer Salat. With many guests present today the mosque was quite packed but for everyday use it is a very large mosque and even if the entire Swedish Jama’at was to gather here only half of it will get filled. It is the responsibility of the Swedish Ahmadis to increase their own numbers and dispel the misconceptions of native Swedes regarding Islam and bring them towards Unity of God. It is the right of Swedes that borne of sympathy and consideration for them and owing to their favour that they have accepted us, we should recompense them in an excellent manner which would be bringing them to God. The dues of the building of the mosque will be aptly paid when it will be filled as much as possible with Ahmadis themselves and also by the locals by doing tabligh to them. We have taken bai’at on the hand of the Promised Messiah (on whom be peace). Therefore we should take lesson from others who have not only forgotten teachings of Islam but have included harmful innovations in faith. Let alone forgetting Islamic values they have also forgotten moral values. Protecting ourselves from this, rather than get embroiled in issues of personalities we should seek pleasure of God in the ways taught by Him. The Promised Messiah (on whom be peace) said: ‘Congregational Prayer is more meritorious because it creates unity. In order to further foster this unity the details of guidance and advice stretch to the point that even the feet should be aligned during Salat and the rows be straight and individuals should be standing literally shoulder to shoulder. The significance of this is that they follow one person and spiritual light of one permeates into the other and there is no dissimilarity that engenders self-centredness and selfishness. In order to attain pleasure of God we should be mindful that after achieving any one objective we are not negligent of the basic objective. Real work will start after the building of this mosque and this is something every Ahmadi in Sweden should remember; always have in view the commandment of ‘And I have not created the Jinn and the men but that they may worship Me.’ (51:57) The dues of worship of God are paid best of all by filling mosques. A hadith relates that congregational Prayer is 25 times more meritorious than the Prayer one offers at home or in the marketplace. And this is because when he performs ablutions properly and proceeds to the mosque with the sole purpose of offering Prayer, he does not take one step without being raised a degree in rank and his one sin is removed on his next step. And as long as he is on the Prayer mat angels will send blessings on him. A person is deemed to be in a state of Prayer as long as he waits for it. Another hadith relates that a person who goes to the mosque morning and evening has God make hospitality arrangements for him in Paradise. Thanksgiving for the building of the new mosque in Sweden should be done by developing more than ever mutual love and affection. Now that the mosque is built, better models of teachings of Islam have to be demonstrated. As the Promised Messiah (on whom be peace) said mosques are a source of making people Muslim. If our practice is not in accordance with Islam and we are not taking the message of Islam to others, people will be drawn to the bright dome of the mosque which can be seen from afar, but they will only be drawn in an outward, physical sense. Whereas the real attraction will only be through spiritual beauty. The sacrifices made in the building of the mosques are noteworthy, especially those by children and the youth. However, the phase of continuous sacrifice has just started whereby the physical beauty of the mosque has to be conveyed into spiritual beauty. And this is a huge task which requires continuity. Every Ahmadi should pledge to uphold the continuity of spiritual beauty. Our responsibilities are indeed increasing and in order to fulfil the dues of this new mosque a revolutionary change will have to be brought about. The verse recited at the beginning also draws attention to Zakat and meeting the rights of the underprivileged. None other than Ahmadis have true insight of financial sacrifice. The Holy Qur’an draws attention to Zakat. Some say that Jama’at does not focus on Zakat but does so on other chandas. Attention is drawn repeatedly to those regarding Zakat on whom it is obligatory. 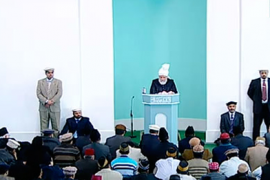 Hazrat Khalifatul Masih has also illustrated the subject in his Friday sermons. Zakat has great connection with the system of Khilafat. In the verses following the verse about Khilafat in the Holy Quran, known as Ayat Istakhlaf(24:56) attention is drawn to observance of Prayer and Zakat. Zakat is not obligatory on everyone. It has its conditions and rules and regulations. Zakat would not cover all the [Jama’at] expenses therefore it is also important to pay regular Chanda and Wasiyyat Chanda. Indeed, the Promised Messiah (on whom be pece) established the system of monthly Chanda. Anyhow, with the building of the mosque our responsibility has increased and attention should be given to fulfil it. This can be achieved by forging connection with God, by keeping an eye on the Hereafter, by elevating the levels of righteousness. We can fulfil this by making efforts to attain God’s pleasure and by observing Prayer and serving humanity. Religion was going to have dignity via the Promised Messiah (on whom be peace) and indeed it has as God sent him in this age as the true devotee of the Holy Prophet (peace and blessings of Allah be on him) to re-establish the credibility of Islam. The very purpose of his advent was to demonstrate the beauty of Islam to the world. The second verse recited at the start of the sermon mentions that when God grants dignity it entails observance of Prayer, paying Zakat, enjoining good and forbidding evil. Dignity in the current age was going to be granted through the Promised Messiah (on whom be peace), the system of Khilafat was going to be established by virtue of him and it did. Today Khilafat in the Ahmadiyya community alone is spreading the correct teachings of Islam in the world, it is building mosques for observance of Prayer, and not places of evil and discord, and these mosques are creating respect, honour and strength for Islam. It is a huge responsibility of every Ahmadi to reflect over this and while fulfilling their pledges try to mould their thoughts in accordance with seeking pleasure of God. In light of this verse, it should be kept in view that when true servants of God seek help from Him, they receive it. They expend all their capacities and strengths for the welfare of humanity and also fulfil the rights of God. They fear God and develop in faith and spend their lives in righteousness, they tell others to do good and stop them from doing evil. May God make us understand all these matters, may we pay the rights of God and also develop in mutual love. May we also pay the rights of mosques as well as rights of tabligh. Having had timely passion for financial sacrifice, may we now adopt unceasing passion for spiritual development so that we can fulfil the pledge that we have made with the true devotee of the Holy Prophet (peace and blessings of Allah be on him).